Hostmysite.com :: How do I view the header information of an email message? How do I view the header information of an email message? Depending on the Mail program being used, the process for viewing the headers will be slightly different. Below are the more commonly used mail programs. Click the email message to view the message. Click Headers at the top right corner of the message. Right click on the message title and select Properties. 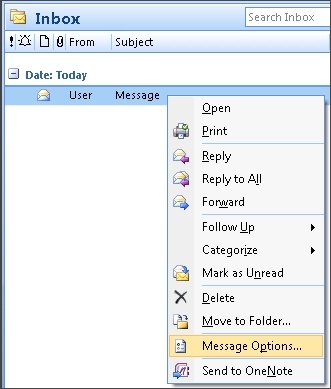 Right click on the message title and select Message Options. View the headers under Internet Headers. Double click on the message title. Click the BLAH, BLAH, BLAH icon. From the View menu, select Internet Headers. From the View menu, expand Headers and click All. Select All from the Show Header detail dropdown.